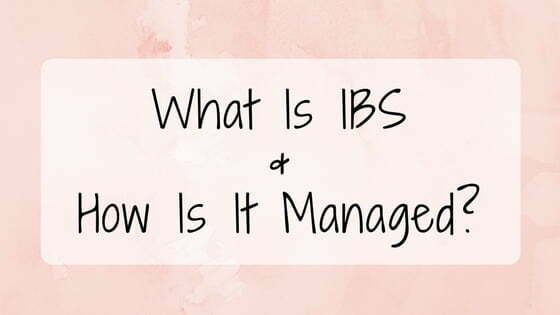 What Is IBS & How Is It Managed? Do you suffer from bloating, gas, abdominal pain and diarrhoea or constipation? Well you’re not alone! In fact, one in five Australians suffer severe digestive sensitivity and it is twice as common in women as it is in men! IBS has a collection of symptoms including bloating, cramping, abdominal pain, diarrhoea and constipation. There is no specific medical test for IBS; rather other conditions with similar symptoms, including diverticulitis, inflammatory bowel disease, lactose intolerance and coeliac disease, are tested for and ruled out, and then you may be diagnosed by your healthcare professional with IBS. The actual cause of IBS is still being researched. However, there are a number of factors that can trigger IBS symptoms including stress and anxiety, an infection like gastro, food poisoning, medications, food intolerances and genetics. FODMAPs are a collection of carbohydrates and sugar alcohols found in certain foods that are poorly absorbed by some people. FODMAPs stands for Fermentable Oligosaccharides, Disaccharides, Monosaccharides and Polyols. If you eat high FODMAP foods, your body may not be able to digest them properly. ProNourish® Digestive Balance Drink – this is a great “top up” snack when you’re on the go. They come in convenient sachets you can mix with water. They are formulated with fibre for digestive health (each serve provides 3.4g fibre) and are low in FODMAPs. They are available from selected pharmacies. Fibre is the part of plant foods your body can’t digest. It is important for healthy digestion and keeping you regular, but it can affect those with medically diagnosed IBS. There are three types of fibre; soluble, insoluble and resistance starch. A low FODMAP diet is likely to reduce your intake of many high fibre foods as many are high in FODMAPs. Since we know that people struggle to eat enough fibre even when not eating low FODMAP, it becomes even more important to consider your fibre intake when eating a low FODMAP diet! You may also choose to include a fibre supplement in your diet to help you meet your fibre intake. When choosing a fibre, make sure it is Low FODMAP certified and able to relieve your IBS symptoms such as diarrhoea, constipation, gas or bloating without making them worse. Choosing a fibre that is a natural prebiotic can also help improve your good gut flora. A good example of a fibre that is able to do this is guar galactomannan or partially hydrolysed guar gum (PHGG). Exercise – releases endorphins that make you feel good and help reduce your stress hormones. Manage your time better – poor time management can be a cause of stress. Don’t over-commit yourself, prioritise your daily tasks and delegate work where necessary. Avoid unnecessary stress – whilst the cause of your stress needs to be addressed, there may be some stressors in your life that you can eliminate. For example, if having the news on tv makes your anxious, turn it off. Learn to adapt – there will be situations where you can’t change what is causing your stress, so you need to learn to adapt to the situation and gain control by changing your expectations and attitude. Schedule some ‘me time’ – it’s important to regularly take some time out and give your body and mind a rest. Find something that you feel is relaxing and that allows you to unwind and switch off, and do this regularly. Seek help – talk to a friend, family member or professional about your stress. Never be afraid to ask for help or seek the help of a professional. Probiotics are micro-organisms that help the ‘good’ bacteria in our bodies to thrive. Probiotics can be found in foods including yoghurt, miso, kefir, sauerkraut and tempeh. However not all these foods can be consumed when following a low FODMAP diet or for those with IBS. This is where probiotic supplements can be beneficial. When choosing a probiotic, make sure it is clinically tested to help relieve symptoms and certified low in FODMAPs. An example of this is the strain Bifidobacterium lactis, it is a strain that is clinically tested to help manage constipation and is low in FODMAPs. Thanks for sharing! Very helpful indeed! Do you think the foods we eat lack a lot of nutrients (that they possibly contained 50 or so years ago) and this also contributes to digestive problems?